Hello Darlings, Neat looking nails tell a lot about how a girl cares for herself externally and internally. I've talked about the signs that your nails reveal about your health in Rescue Your Nails: Signs of Good Health and how to solve the issues. Today I would like to share some of my favorite nail care products, DIY nail care tips as well as what to look for in a safe nail salon. As previously mentioned, I am very concerned with how my manicure and pedicure looks. That said, I am even more concerned about going to random salons because of the health risk. I have been going to the same salon for years, yet more often prefer to take the time to attend to my nails myself. With quality tools, patience and some practice every girl can perfect the art of nail care. As for my step by step manicure routine here's what work's best for me. Usually, I do my nails while watching a movie. Just be sure to always sterilize your stainless steel tools by boiling them in water for 10 to 15 minutes. Step 1: File the nails to a desired shape and then soak them in soapy water. Step 2: I prefer to cut off my cuticles but be sure to soak them and never cut dry. Also push cuticles back before cutting. 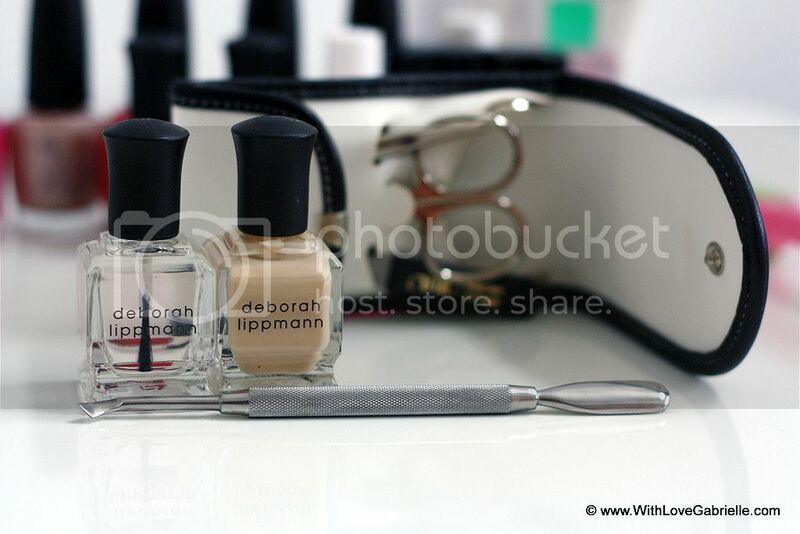 Step 3: Apply base coat, my preference is Deborah Lippman Ridge Filer, to make sure that the color goes on smooth. Step 4: Apply two coats of color but be sure to give some drying time between every application. Step 5: Finally apply the top coat, my preference is Deborah Lippmann Hard Rock. Regarless of the color, the shinier the nails the better the effect. Of course most girls enjoy a manicure and pedicure treatment, of course while reading up on the latest celebrity gossip. However nail safety should come first, therefore the salon should feel as sterile as a doctors office! Make sure that the tools are sterilized, the clear sign is when they come directly out of autoclave sterilizer or are sealed in a plastic bag. According to Centers for Disease Control and Prevention, a dirty pedicure station can spread Mycobacterium fortuitum through a foot bath and become a breeding ground for the spread of athlete's foot, nail fungus and bacterial infections. It is best to ask for no jets, since jets increase the risk of picking up germs from recycled water that has not drained property from a previous client.